Published March 13, 2018 Filed under Under Our Dome, USN Columnists. Total of 1 comment in the discussion. Stephanie Hatch has announced the candidacy of her husband, Orin. She’ll be gathering signatures tonight in Riverton. In true independent RINO fashion, Hatch will be bypassing the caucus and reaching out to his conservative base in front of the liquor store/Salsa Leedos during Happy Hour from 6-7:30 pm. Someone should vet this guy. Acumen has been know to have a Low E.Q. = inability to self-regulate one’s expression of emotion. My mom would’ve washed my mouth out with her favorite Palmolive dish soap if I used language like that towards others. It is unclear if Love knows of her complicity. It looks likes smartphone technology is going to be coming to the neighborhood caucuses next week. This could present a problem because many of the caucus attendees delegates are in their 80’s and would prefer to use “dumb-phones” that don’t require downloading apps or other newer forms of technology. And, what happens if someone forgets to bring their smartphone? SCC members remember the recent test of this smartphone voting platform that failed spectacularly at a recent SCC meeting, causing everyone’s phones to be hacked. That problem has supposedly been fixed and is now extremely secure. But questions remain about the possibility of a voter not being present or being able to prove that they are present. How would they be able to prove that it’s the delegate voting and not a passing truck driver who happened to stumble onto the same wavelength. Answer: You put a location option and make sure they are in the building, or you put on the screen a code for just that race and that person. But, locations can be faked and codes can be shared. This sounds like a job for the technology committee? I’m sure they’re taking all of this into account. Is the Utah election office in violation of the state law that states there will be a copy of the political party bylaws on file at the state election office within two weeks of changes to the party documents? Even if Cox is NOT going to enforce the law, shouldn’t it be posted as per state code? To choose to not speak, is to speak. To choose not to stand for one side is choosing to stand for the other. There is no middle ground on freedom. Anderson continues to pull tricks out of his sleeve with less appeal then a Las Vegas street magician. In an email, Anderson displays the same lack of class and honesty as his attack-dog friend showed earlier in this column. People are guessing that Anderson’s wife actually wrote the missive because the use of one of her favorite words: PURSUANT. Anderson didn’t quote which bylaws were violated, or which Robert rules were violated, or which Constitution components were violated. This is misinformation and propaganda at it’s finest. One would-be commentator, John Mulholland, is now asking for a public apology for voting for this bylaw and tagged some of the SCC members in his post. They responded by asking Mulholland to apologize for siding with those who break party rules. 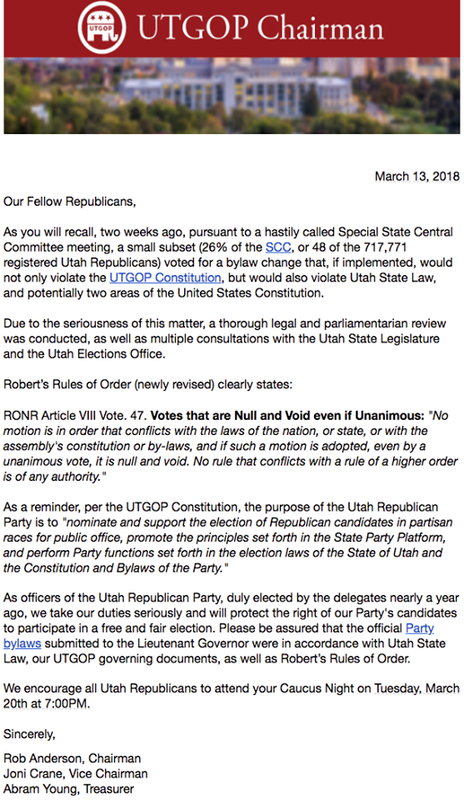 First off, Anderson is lying about the bylaws voted for by the SCC violating the UTGOP Constitution and the US Constitution. Does it violate the unconstitutional SB54? SCC patriots hope so. Secondly, Anderson is stating that he ignored the SCC and submitted his own bylaws? If so, it is Anderson AGAIN who is in violation. Anderson is an embarrassment that the party should rid itself of. This writer and many other patriots will be attending caucus night. Anderson and his masters have been working towards abolishing the caucus. Since Anderson loves corruption and tyranny so much, why doesn’t he join the party that reflects his values, the Democrat party. To that, one SCC member commented: “My absolutist forefathers would have a time with his answer as do I. They came up from the south and fought slavery tooth and nails. We won. A bad law is still a bad law. If he values laws, why is he ignoring the Party Constitution and Bylaws? Clearly he believes SB54 trumps the Party and in his mind that gives him more authority to do what he is doing. He is very confused on where the law stops and where the right to assemble begins.